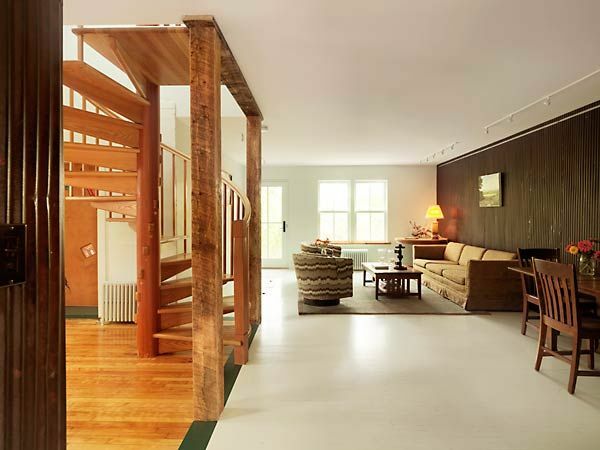 This two-story little house in Bristol, Vermont, is truly one-of-a-kind. 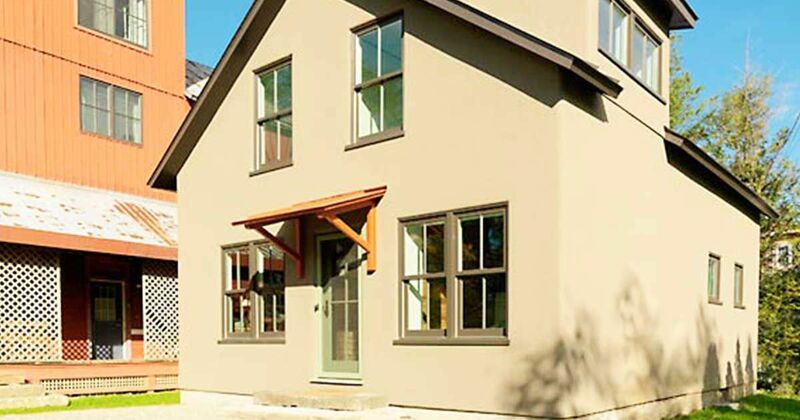 It was designed and built by Conner & Buck, a contracting firm dedicated to sustainable design. They believe in using renewable materials, creating healthy homes that are low on toxins, and building smaller sized homes when possible. 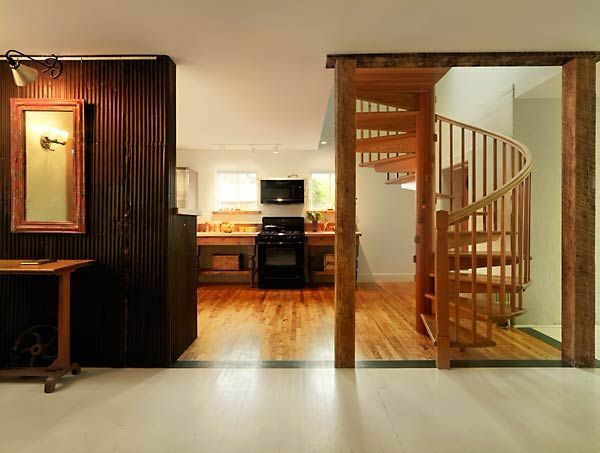 This house features reclaimed wood, salvaged materials, and unique architectural details. The first floor is designed as an open layout that includes a living space and kitchen. Up the spiral staircase, you'll find two bedrooms and a bathroom. Take the full tour below. 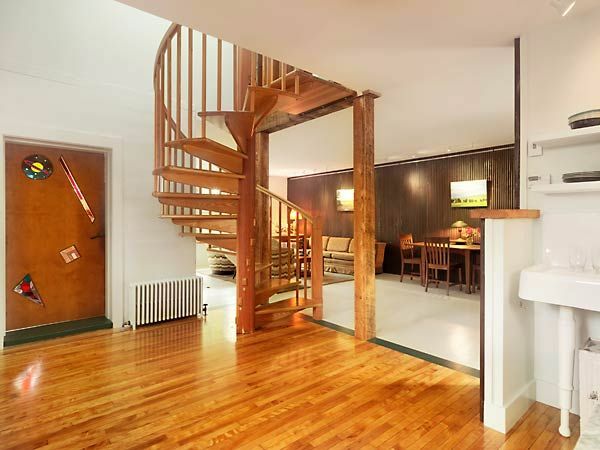 The stunning wood spiral staircase is the focal point upon entering this home. Around the corner, the living room and dining space is visible. Straight ahead is the kitchen. This view shows a glimpse of the kitchen. Counter-height table tops were used in the place of traditional cabinets, giving the space a homey farmhouse type feeling. The living room takes a more modern approach. Vintage mid-century furniture is arranged in a comfortable setting. A wall of galvanized metal finishes the look. There is no wasted space in this small bedroom. 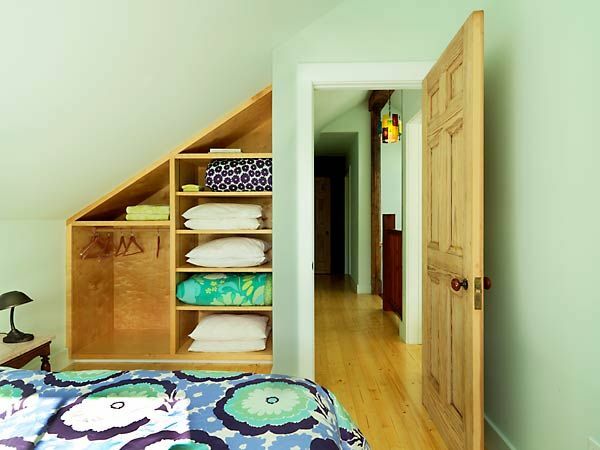 What could have been an empty nook by the door, has been transformed into a useful storage system with built-in shelves. 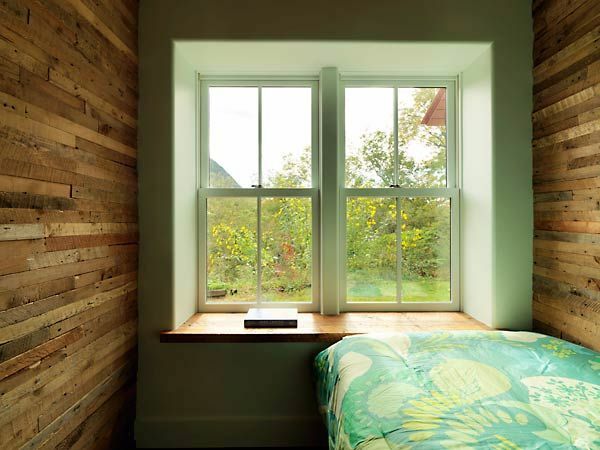 This bedroom features salvaged wood on the walls and a bright window, creating the perfect cozy spot to curl up with a good book. 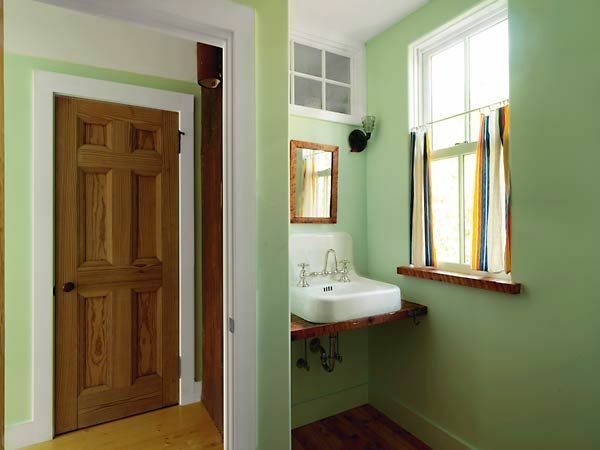 More warm wood accents are carried into the hallway and bathroom. The lime green walls are cheerful yet soothing. What do you think of this unique home? If you're inspired by the sustainable design and special details, be sure to share it on Facebook, Instagram, and Pinterest.